Kofi Annan (1938-2018) was a Ghanaian diplomat who served as the 7th Secretary-General of the United Nations (1997-2006), where he promoted the UN Millennium Development Goals, launched the UN Global Compact in 2000 (a principle-based framework for business), and appointed a panel on UN peacekeeping, also in 2000. He was Founding Chairman of the Kofi Annan Foundation (2007, Geneva), which works for a more fair and peaceful world, supporting democracy, combating hunger, addressing drugs, and promoting youth leadership. He is Chairman of The Elders (a small group of distinguished world leaders concerned with peace, human rights, and climate change), President of the Global Humanitarian Forum in Geneva, Chair of the Global Commission on Elections, Democracy and Security (2011), and Founding Chair of the Alliance for a Green Revolution in Africa which seeks rapid and sustainable growth for smallholder farmers. 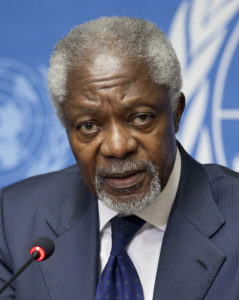 Previously, Annan served as UN Under-Secretary-General for Peacekeeping (1992-1996). He is author of a memoir, Interventions: A Life in War and Peace (2012), and of We the Peoples: A UN for the 21st Century (2004). He was co-recipient with the UN of the Nobel Peace Prize (2001), holds >30 honorary degrees, and has received many honors and awards such as the Confucius Peace Prize (2012).